A Falling Leaf short film special from BTBounds coaches Nirvana Ortanez, Madison Blackley, Melissa Riitano, and Jacque Lammert. BTBounds at Boreal 2018 Recap Video! The sun was shining, the snow was soft, and on one of the final spring weekends in Tahoe last April, nearly fifty women from all over California, Oregon, Washington, and even as far as New York descended on Boreal Mountain for the first-ever Beyond the Boundaries at Woodward Tahoe. BTB coaches Nirvana Ortanez, Taylor Elliott, Fancy Rutherford, Faye Gulini, Melissa Riitano, Madison Blackley, Christine Savage, Jackie Lammert, Savannah Golden, and Mary Walsh were on hill to facilitate learning new tricks and sharing the stoke of snowboarding. For two days, the ladies lapped a private park built by Mizl Ybarra, Joey Leppien, and the Woodward Tahoe park crew. It was a park party of the best kind. Check out the video to get a glimpse of what went down. BTBounds returns to Boreal April 6-7, 2019. Check out www.btbounds.com for the full US, Canada, and Japan 2019 schedule. Video by Sam Sosnowski. - January 19-27, 2018 - 9-day: Niseko to Tokyo Trip - five days of snowboarding and 2 days/2 nights in Tokyo. 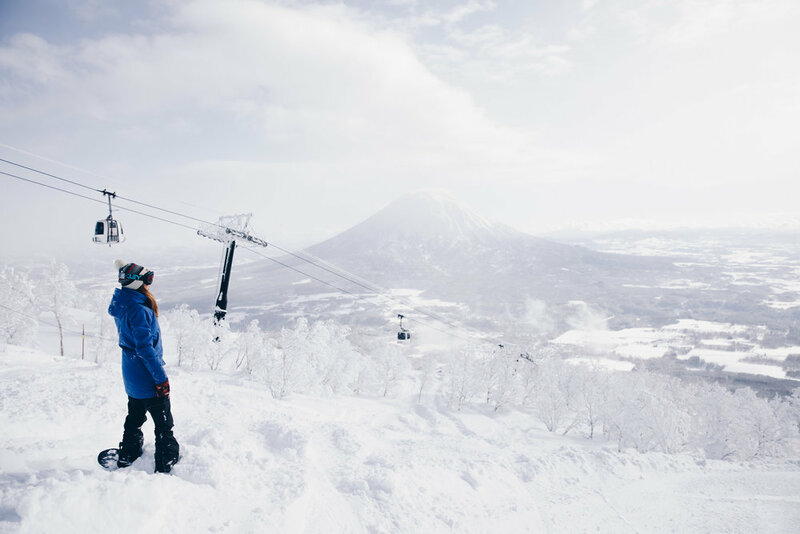 Each trip focuses on in bounds and out of bounds (conditions permitting) at Niseko United (home to four individual resorts) and Rusutsu. Each mountain has its own personality, snowpack, and epic views. These resorts are unique in that they offer backcountry terrain within their footprint that is accessed easily from lifts and at times, very short hikes, and leads back to the chairlift. We recommend being comfortable on both blue square and black diamond trails to get the most out of BTBounds in Japan, but do not worry about powder or backcountry-specific experience—we have multiple guides to ensure that we can go at the right pace for the entire group! After long, epic days on hill, we spend evenings in 3-4 star accommodations and immerse ourselves in the culture of Japan via its sights, sounds, and cuisine! Niseko is home to incredible ramen and sushi, as well as plenty of unique Japanese snacks and other fare. We can also accommodate any dietary needs or restrictions. On the 9-day: Niseko to Tokyo trip, we will depart for Tokyo for the last two days and two nights and dive into city life! Extra fun and unique experiences include attending the Robot Restaurant show, enjoying the serenity of an ancient temple, shopping in Harajuku and petting owls at an owl café! Japan is one of the most amazing places in the world and snowboarding on The North Island is unlike any other experience. Join us this January for Japow slashes, onsen, and an incredible adventure with a crew of like-minded ladies! Payment can be made in full or a spot will be held with a $500 deposit. Full payment must be completed by November 1, 2018. Please contact us for payment plan options. From street rails to powder lines, BTBounds Head Coach Christine Savage does it all! Her full part from 2016-17 just dropped on Snowboarder.com, featuring footage from Too Hard and Powanoia. Enjoy and stay tuned for more from this Savage in the fall when the new movies drop! Filmed by Kieth Rutherford and Sam Tuor. Edited by Kyle Beckman. Our favorite dog mom to Cherry and Shelby, Fancy Rutherford aka Fancy Jibberford, dropped a hammer-heavy full part from Too Hard's 2017 movie, Yas Quain. Fancy's got killer style, so make sure to give her segment a watch. Feel free to pick out tricks you'd like her to help you learn, too! :) Filmed and edited by Kieth Rutherford. To say that Madison Blackley had a busy winter last year would be an understatement, but this talented wunder-rider and video part veteran was up for the challenge! During the 2016-17 season, Madison logged clips for not one, not two, but three film crews: Too Hard, The Uninvited, and Powanoia. And now, in one chock-full full part, here is Madison's winter. Stay tuned, because this SLC native will be releasing new parts next fall!